I'm heading back to KL tonight and while I'm not particularly worried about my own flight (at least, no more than usual), this doesn't look good at all. :( missing for just about ten hours now. The thing that weirds me out is that apart from a brief passage over the South China Sea, the plane should be flying mostly over land.... It doesn't seem like there's anywhere along the route where it might have went down without being detected? Yep, that's the only part that's been confirmed... It was travelling at cruising altitude in good weather, so it's really unclear what happened after that. yeah this is horrifying, how can it just disappear? UPDATE [12:37]: Tuoi Tre, a leading daily in Vietnam, reports that the Vietnamese Navy has confirmed the plane crashed into the ocean. According to Navy Admiral Ngo Van Phat, Commander of the Region 5, military radar recorded that the plane crashed into the sea at a location 153 miles South of Phu Quoc island. Oh god, probably my #1 nightmare way to die. Because you have all those minutes (as the plane descends) to contemplate your imminent death upon the deep dark sea. Shudder, shudder, shudder. I fly over the ocean a lot, and always feel some anxiety, so these (extremely, extremely rare) events chill me to the bone. I usually feel more "reassured" (or less terrible unease) when these things are due to pilot error rather than random mechanical failure... not exactly sure why. (Less vicarious sense of helplessness?) Though I guess often it's a combination (in varying proportions) of the two. "Vietnamese aircraft spots liquid and "rubbish" on surface in overlapping waters of Malaysia and Vietnam, official tells CNN. " Just found out that an old college friend, her sister and her mother was on the flight. Another sister is close friends with my brother and she's devastated right now. Argh this is so so so fucked. As disturbing as this is, is it a rarer occurrence than it used to be? In my childhood and young adulthood, I remember crashes happened seemingly all the time. Maybe they still do and they get buried by other news, but air travel has to be safer now than it was even just 15-20 years ago. In a development that raised fears of foul play, investigators said they were looking into reports that two men — one Italian, the other Austrian — whose names were identical to those listed on the plane’s passenger manifest, had reported their passports stolen. The Italian citizen, Luigi Maraldi, told news organizations in his country that his passport had been stolen while he was in Asia, that he is currently in Bangkok and that he was is not the Luigi Maraldi listed on the plane’s manifest. The Austrian Foreign Ministry said, according to news accounts, that the one of its citizens, Christian Kozel, 30, reported that his passport was stolen two years ago in Thailand. the false-optimistic rumors and reports that were running rampant yesterday (ie, "towers just received a signal from the plane! we heard it may have landed at an alternate location") have to be the worst for these fearful families. Looks bleak at this point, sadly. As disturbing as this is, is it a rarer occurrence than it used to be? Depends where you are in the world from what I can tell, and also what airlines. The huge, terrifying series of American air crashes in the late seventies and early to mid eighties have always given me some pause since I grew up with them -- for a while there it seemed like there was one big one every year or more, and the PSA Flight 182 disaster in San Diego occurred while I was there in third grade. Things fell off from there, but there have been plenty of notable commuter/local route air crashes in the last decade alone, and it's fairly well documented that pilots run crazy long shifts for comparatively low pay (one reason I liked that Sully pilot with the 2009 Hudson river landing is that he pretty much immediately used his public fame to say "Guys, things are REALLY fucked on that front."). As Ask The Pilot points out (can't find the exact post, but it's there somewhere), the Asiana crash in SF last year was the first crash-with-fatalities of an airliner in the US since 2001. Considering there are around 30,000 flights/day worldwide, crash stats are still insanely low (but yeah, they were higher in the 70s/80s -- 1985 still stands as the worst year on record). I do worry about fatigue/low pay (something else ATP talks about) -- pilots on regional carriers start at something like $14k/year. iirc, fatigue was one of the factors in the Colgan Air crash outside Buffalo a few years ago. And Sully OTM. Besides that there was that comair crash in Kentucky and then there was a crash in buffalo iirc but that's it. flying is still the safest means of travel, it's just that...when something goes wrong, the odds of still being alive afterwards are much worse. you can survive a car wreck. very difficult to survive a plane crash. and if the death isn't instant...very painful. not to be grotesque, it's just...one of those things where although the probabilities side with your safety, the lows are that much lower if you're that .01%. Wasn't there a study showing that most air crashes are actually pretty survivable as well? Like some large percentage of crash victims are not fatalities? yeah and before yesterday, Msia Airlines had had only two fatal crashes in 40 years of operations, one of which was a hijacking. It's a pretty impressive record, considering they run about 120,000 flights a year... whatever the problems MAS has with financial management (and there have been MANY, no thanks to govt/political interference) have never extended to its flight operations. what constitutes a 'large percentage'? The MA 777 was damaged in a runway collision two years ago. I'm wondering if there was more damage that was undetected during the repairs. The China Eastern Airbus was waiting to take off when a wing of the Malaysia Airlines Boeing 777 bumped the left elevator on the tail of the Airbus. Both aircraft received damage that prevented them from continuing their flights. The top portion of the wing of the Malaysia Airlines plane was broken off and dangled on the tail of the China Eastern Airbus, according to pictures posted by passengers on the Internet. i had a frightening conversation with a friend's father, an aerospace engineer, not too long ago. basically i'm never going to fly on a south american airline. It looks like the two people on false passports were traveling together. Two people who traveled on the missing Malaysian Airlines flight under the passports of an Italian and an Austrian citizen appear to have bought their tickets together. The transport minister seems to have clarified that it is just two passengers they are looking at. Yeah, I definitely remember it. Coming so soon after 9/11, people were (understandably) freaking out about it possibly being another attack. Those fears were quashed early on in the investigation, iirc. Artist friend said on FB that there was a delegation of 29 Chinese visual artists on the flight. Yeah, Dayo I remember the 2001 crash is Queens really vividly too. It was awful. Skipping 730 messages at this point... Click here if you want to load them all. PBS' Nova covers the disappearance.Good summary of everything. The five teams of investigators were made up of officials from Boeing, Inmarsat, France’s Thales Group , the U.S.’s National Transportation Safety Board, and the Australian Defence Science and Technology Organisation. Each was asked by the ATSB to analyze the data independently and draw their own conclusions. exact same make/model i just took to heathrow. yikes. Well, someone's gone off the deep end. I have some clients at Baikonur - i'll ask around. I have no idea how something this crazy actually ends up being published. in re: nymag's jeff wise article. the biggest weakness in his theory is the total lack of a coherent motive for such an elaborate plot. even the most off-the-wall speculative motives seem far too weak to justify the theorized actions. one simply asks why on earth would anyone conceivably do this? as long as you disregard this glaring hole, his theory hangs together fairly well. It's still pretty impossible for someone to do this undetected while crossing over land borders too, even by flying close to territorial boundaries, as Wise suggest. somewhat related: I've found that it's not a good idea these days to tell cab drivers in Malaysia I'm a reporter. Every single one of them is a Jeff Wise. Tbf, I think he was less :shrug: and more admitting that lack of motive is a major missing component of his theory. seems kinda nuts to dream up an outlandish and insanely detailed theory without also coming up with an answer to the very first question any rational person will ask - 'why'? Well, once you move well beyond the realm of Occam's Razor, I imagine "why" becomes less important. also, when there's no clear indication of who or why, it perhaps makes (or seems to make) more sense to deal with the evidence you do have than to speculate about motives. when you hypothesize a state-funded and state-planned crime on this scale, yet you cannot supply the first idea of what possible benefit they could derive from it, as opposed to the massive risks involved, then you have a deeply, deeply flawed hypothesis. because equipment malfunction followed by a crash does not require a crime, a criminal, or motives, it becomes the most reasonable default explanation. As far as I know, Baikonur cosmodrome is actually a really busy "spaceport" full of non-Russian scientists and engineers working to get stuff up and down to the International Space Station and the like--you'd think they'd notice a massive jet landing there and being buried. Was the suggestion that something was buried? I thought the implication was that this was a disused temporary way station that got torn down after the plane landed, refueled/etc., and then was flown out somewhere else within Russian-controlled airspace where no one else's radar was going to notice. Anyway, the topic most here and elsewhere seem to be missing and perhaps part of the reason this was published is that this is supposed to illustrate in passing how easy it is for someone who leans rational and skeptical to fall down the rabbithole of a theory of their own invention. Both this and the theory itself are somewhat unclear on the face of the piece, because it appears to be overly-abbreviated, not necessarily by the author. I'm not saying I agree with the theory by any means, but it's not completely implausible. A large object that appeared to be an airplane part washed up Wednesday on the shore of Réunion, a French island in the Indian Ocean, prompting speculation that it might be debris from Flight 370, the Malaysia Airlines jetliner that disappeared in March 2014. A French official with knowledge of the investigation said that the object appeared to be a wing flap, possibly from a Boeing 777, the type of aircraft used on the flight. The official said that the object was about 9 feet long and 3 feet wide, and that it appeared to have been in the water for a very long time. The French official said that the authorities were in the process of designating a laboratory in France where the object would be taken for examination, and that pinning down exactly which plane the object came from may take several weeks. Even so, aviation experts who viewed published photos of the object said it strongly resembled a part of a modern jetliner wing known as a flaperon, one of the control surfaces that pilots use to guide the aircraft in flight. Whether it came from a 777 was another matter. They've now found a suitcase, some bottles, and a plane door. All almost certain to be from MH370 but we'll get confirmation by tomorrow at the earliest. They've just confirmed that the wing part was from MH370. Incredible, really and still so damn sad. I want to bring in retired colonel Steve ganyard, a pilot himself. I want to take our viewers back to that piece of wing because the angle of that flap and how intact the debris is, as you heard Jim reporting, leading someone to believe that someone might have deliberately done this. What do you think tonight? I think you're right. There are two scenarios. Everybody was unconscious, the airplane went in at a very steep angle. What we're seeing here on this debris is something that's intact which opens the very chilling possibility that there was somebody alive, conscious, and trying to land that airplane after it ran out of gas. Let's not lose sight of the fact that we're still no nearer finding the bulk of the wreckage, the bodies of the deceased or any answers as to how this tragedy happened. was just thinking about this the other day, did any of that debris mentioned just upthread ever get confirmed as being from the plane? What seems very weird to me is that, if the whole point was murder-suicide, it could have been accomplished much more simply, directly and easily than what happened. Once you incapacitate the crew and passengers, just point the 777 at the ground and mission accomplished. Why go to such lengths to make the plane disappear when that is not essential to the main plan? Good presentation. Really is a headscratcher. Can't believe I've been covering this story for five years straight. That's a pretty good video, aside from a couple of minor factual errors (e.g. 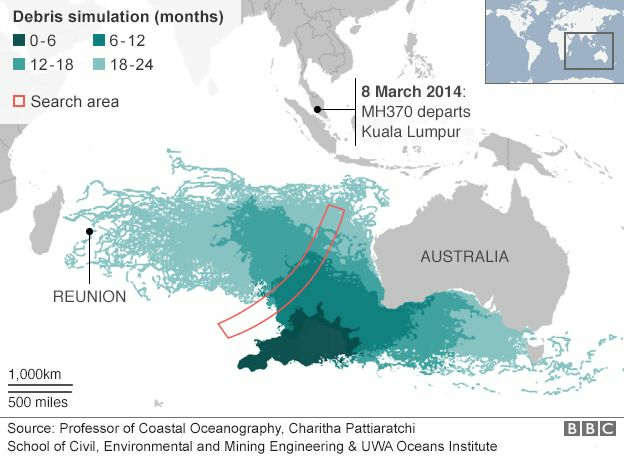 the Ocean Infinity search took only three months rather than more than a year). I think the original hypothesis - fire/electrical failure leading to hypoxia and hours of flight on autopilot - is probably still the best explanation for what happened, everything else is either too insane or too simplistic. at this point, it's a matter of identifying where exactly it went down, and finding people with enough money, time, and tech to search. And that's the hardest bit.